Connect easily to your computer using any Android device or another computer from any place on Earth. Remotely access and control any files and applications on your PC in lag-free HD quality! Creating a Monflo account is crucial in order to utilize the full potential of Monflo and needed to buy Monflo license. Learn how to create Monflo account and about license options available. To create an account click here or do it from our homepage after clicking Login. You may choose between several licensing options available, depending on the additional features that you need. Check all options here. Connect Anywhere allows to connect to a server computer regardless of any technical obstacles, like firewalls and NATs. This feature requires to purchase additional subscription. You can choose to be billed monthly or annually. If you choose to be billed annually, you get 2 months for free! Subscribe now! Try the fastest and the best quality remote access and control software for Windows PC on the planet. Monflo allows you to connect to your computer using Android device or another PC. Use your Android devices, such as smartphones and tablets, for business and entertainment. 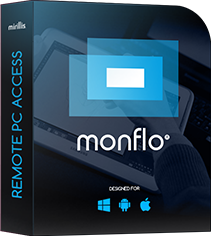 Discover the new dimension of remote access with Monflo. Copyright© 2014-2017 Mirillis Sp. z o.o.